Ustica, an island located about 65 kilometers (40 miles) north of Palermo, has a Mediterranean climate: winters are mild and relatively rainy, with sunny periods, but also waves of bad weather, characterized by wind and rain, while summers are hot and sunny, a bit stuffy, but tempered by the breeze. In spring, in April and May, sometimes fog can form in the morning. Although the temperature is generally mild, the wind, which blows especially in the cold half of the year, can increase the sensation of cold. The island is accessible by boat from Naples and Palermo. In inland areas, there are hills, and on the highest point, 250 meters (820 feet) above sea level, lies the weather station: here, the daily average temperature ranges from 11 °C (52 °F) in January and February to 25.5 °C (78 °F) in August. At sea level, you can expect a temperature about 1 degree Celsius (1.8 degrees Fahrenheit) higher. Snow is very rare, and only occurs in the coldest periods. The lowest recorded temperature are around 0 °C (32 °F) in January, February and March, while the highest, which occur when the sirocco blows from Africa, are around 38/39 °C (100/102 °F), recorded from June to August. 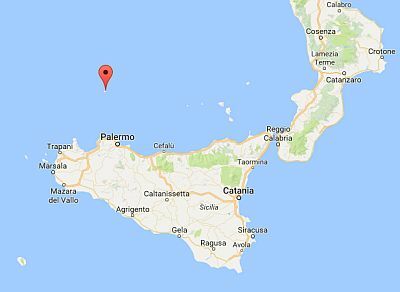 In Ustica, 505 millimeters (20 inches) of rain fall per year, with a maximum in autumn (in October and November) and a minimum in summer, when it hardly ever rains. As you can see in the following table, already in May there is little rain. 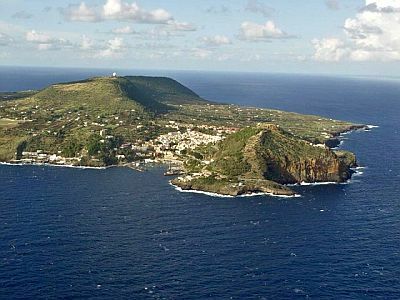 The amount of sunshine in Ustica is excellent in summer, when clear skies prevail; in winter, sunny periods, which can occur in this season as well, alternate with cloudy periods. The beaches in Ustica are few, since the island is of volcanic origin: generally the coast is formed by cliffs overlooking the sea, or by small bays where you can sunbathe, like the famous Cala Sidoti. Thanks to the Marine Protected Area, on the north-west coast it is possible to swim (and dive) in waters where it is forbidden for any kind of boat to pass. The sea in Ustica is warm enough for swimming from July to September. In June, the sea is still a bit cool. The best time to go to Ustica for a beach holiday, is the summer, from June to August. The water temperature is comfortable enough from July to September, but in September, which overall is still a good month (especially in the first half), the first weather disturbances begin to affect the island. In June, as mentioned, the sea is still a little cool, while in May it is still cold, and sometimes the air can be a little too cool for sunbathing as well (perhaps because of the wind). April and May are advisable for hiking, perhaps in the prehistoric village, while in summer it can sometimes be hot to get around (especially in July and August: in June and September usually the temperature is enjoyable or at least tolerable). In October, the temperatures are mild, but the days are shorter and the weather can be rainy and windy.